Equal number of players start on the cones. Players take turns to carry ball across the diagonal of the square. Use different techniques of delivering the ball. 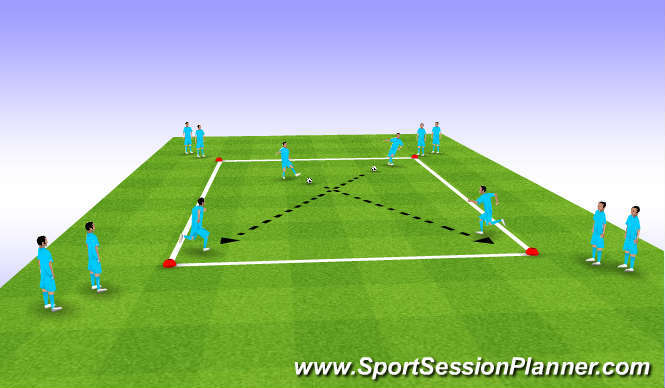 Take, Short pass, Long pass, One Two, Over call (first player steps over ball to allow second player to recieve.) Swap balls in the middle, watch the first swap as the players will make a mistake, funny. Correct and encourage the ball to be played into the path of the player crossing. Technique, Passing, Accuaracy, Weight. Vision, Control, Communaction, First Touch.